MRG WANTS YOU! NOW RECRUITING! Save the date! January 18th is MRG’s RECRUITMENT NIGHT at Crossfit Deprivation! We are always on the lookout for dedicated and enthusiastic individuals to add to our league. No experience required! Can’t skate? We will teach you! Don’t want to skate but still want to be a part of this amazing league? We can train you to be a non – skating official! We train referees too. Men and women over 18, come out and see what we are all about and have some fun while you’re at it. We are teaming up with Crossfit Deprivation, to bring you a fun recruitment night on January 18, at 8:00 pm (eastern time). You will get to meet the team, learn about the league, and talk about the fantastic world of roller derby. It’s not all talk! We also will go through a light workout. Roller derby is a great way to get and stay in shape! For recruitment night, please come prepared to move your body. Workout attire is recommended and please bring a water bottle. Light refreshments will be served. Childcare will be provided. We can’t wait to see you! 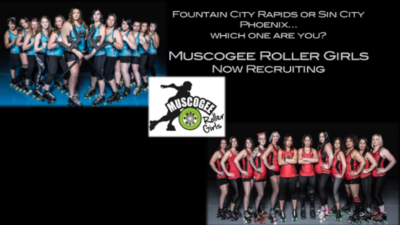 2018 will be the year that you give back to yourself and become more than you ever imagined with the Muscogee Roller Girls! Please email recruitment@muscogeerollergirls.com to let us know you are coming!